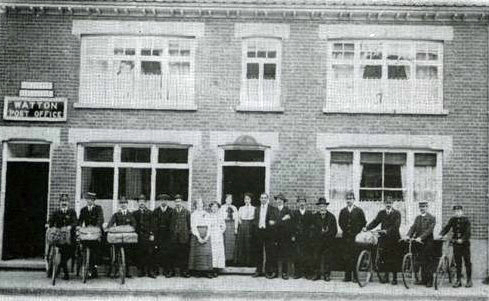 Watton Post Office Staff and Postmen circa 1912. Third from left is W. Lyles, 4th A. Bailey, 6th J. Whalebelly. Mrs Stibbon, the Postmistress is in the doorway with her husband on her right. Next but one is postman Brown and next to the elderly man is Tom Drew. Going back a few years, the 1900 Kelly’s Directory of Norfolk lists William Stoveld as the Postmaster. He has some history with the place being listed in the 1883 Directory too as Stace, William Stoveld, postmaster, bookseller & stationer, etc. And there is a more detailed page here about him. So that ties the Post Office to that building for a number of years. 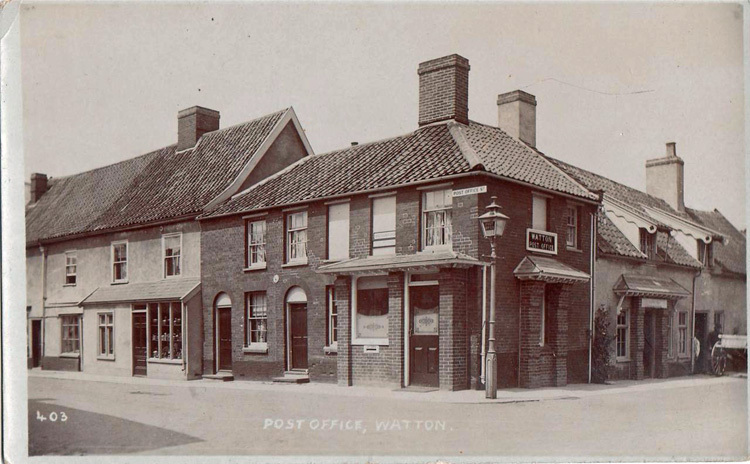 I also have another Post Office located in Watton too. Here’s the postcard and Google Street View.